Anne Taylor Nash (1884–1968) did not begin painting until she was forty years old, when she became inspired by the example of her close friend Elizabeth O’Neill Verner, an artist and a key figure in the Charleston Renaissance. Nash would go on to study art at the Gibbes Memorial Art Gallery (now the Gibbes Museum of Art) in Charleston, the Pennsylvania Academy of the Fine Arts, and the École des Beaux-Arts at Fontainebleau, France. 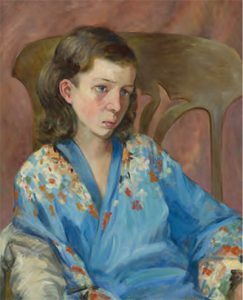 Over the course of her artistic career, Nash produced an admirable body of work, mainly portraits, demonstrating her keen eye for color and composition in both her formal, commissioned portraits and her more relaxed likenesses of family and friends. Nash and her family moved to Savannah in 1937, where she spent the remainder of her life as an active participant in Savannah’s art scene. She exhibited her work at the Telfair Academy with the Savannah Art Club on at least ten different occasions from 1931 to 1958. Given her long association with the museum, Telfair is delighted to be presenting the first solo museum exhibition of her work since her 1933 show in Charleston. collection of John and Virginia Duncan, Savannah.